I love this recipe like I love every recipe that I have tried that has come from the Pioneer Woman. Her recipes are incredible and this one is no exception. This was one of those recipes that everyone gobbled down in a hurry. We didn’t have a noodle left once dinner was done. I think the crazy part of this recipe is just how easy it is. It’s hard to imagine that such an easy recipe could possibly have so much flavor and pazazz. If you are planning something with spaghetti noodles one night make double the noodles and refrigerate them until you are ready to make this recipe. Although the recipe really calls for fluid thin noodles I made it with spaghetti and let me tell you I don’t have any regrets that I do. I can’t wait to make these again and my know my family can’t wait either! Cook Noodles or Pasta according to package instructions, drain and place back in the original pot or a serving large bowl. 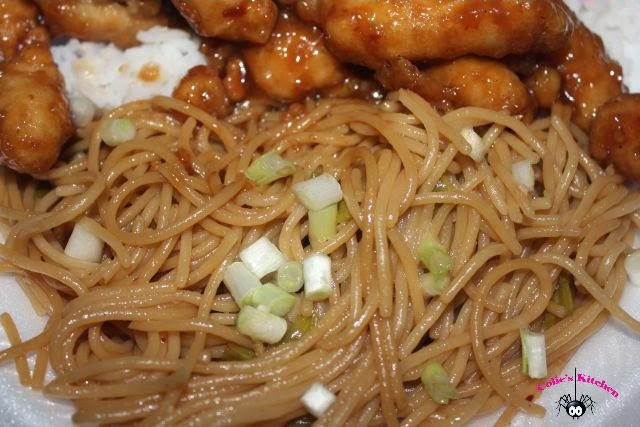 Pour sauce over warm noodles and toss to coat very well. You may need to toss this a few times. Sprinkle with green onions and toss again. Then toss again right before serving.